My name is Norman Allan; I am the proprietor of a successful specialised engineering business in Lithgow NSW finding practical solutions to specific problems. I am being affected by large amplitude infrasound and despite my efforts to obtain relief through appeal to the NSW Environment Protection Authority, none has arrived. I wish to record my experiences and observations. Most are relevant to wind farm nuisance issues. Infrasound generated by large rotating fans is tangible, despite being on the very edge or below the normal range of human hearing. I refer here to “infrasound” in a generic sense as frequencies at, or below, the lower frequency limit of normal human hearing. It matters little whether the fan blades are rotated by wind to drive a generator, or a motor is driving the fan blades to create a wind. My experience over the last two years indicates that the size of the fan blades and speed of rotation govern the quality and quantity of infrasound and this is overlaid by resonance effects. Of concern is the debilitating effect of high amplitude infrasound upon my family and community. Of further concern is the apparent unwillingness to acknowledge high amplitude infrasound as a community disturbance issue by the NSW Department of Environment and/or the NSW Department of Planning. It would appear that narrow regulatory guidelines and artificial criteria related to audible sounds allow high amplitude infrasound to be disregarded. Further, it appears that efforts to detect, quantify or ameliorate high amplitude infrasound are subject to confounding by an array of avoidance strategies that involve both governmental and commercial interests. As a result, physical, social and psychological problems arising from large amplitude infrasound are foisted upon those directly affected by it, with no avenue of redress. In a small town like Lithgow, my business and the livelihood of many others is largely dependent upon the coal and power generation industries. This reduces the willingness of individuals to speak up, as they do not want to become known as the complainer who reduced incomes for many. Yet, living standards are steadily decreasing due to reduced quality of life. My house is located on the escarpment at Clarence, about 6 km east of Lithgow as the crow flies. The Clarence, Springvale and Angus Place collieries occupy a 4 to 15 km radius to the North West. Over the past two years, noise levels at my house have become unbearable. Vibration causes the entire house to resonate. Sound pressure levels inside our home have been measured at levels between 80 and 115dB. It appears likely that the source of the noise at my house is from a new type of extremely large mine ventilation fan anchored to the rock and driven by a 3,600 horsepower electric motor. The power consumed by this fan is remarkably similar in capacity to the power generated by a 2.6 Mega Watt wind generator. By comparison, the two wind generator towers at Hampton, to the south of Lithgow, are tiny, at only 660kW each. Collieries have traditionally utilised multiple smaller ventilation fans. Within a similar radius to my house, at Lidsdale, is a base-load coal burning power station that also uses large fans to drive air into furnaces. However, obtaining a clear view of the source of the high amplitude vibration impacting my family has proven difficult, due to a limited view by the NSW EPA, limited regulations, lack of clearly defined quantifiable processes for measuring low frequency vibrations at high amplitudes and an apparent effort to frustrate accurate measurements through what appears as misdirection and collusion. I have no doubt that those affected by wind farm noise have been affected in a similar manner to my family. In my situation in Lithgow, NSW, I have attempted to gain relief from high amplitude vibration that manifests as infrasound plus transmitted vibration to my house, which resonates at different frequencies and at large amplitudes. These vibrations are partly within hearing range and partly perceived by physical effects. Various terms are used to describe low frequency vibrations. In any case, it is vibration, whether it is within the perceptive ability of any selected individual, or not. Of particular importance is whether it is defined as “vibration” or “sound”. Claims that infrasound cannot be perceived or heard by humans is clearly false and leads to obfuscation of the real issue. We must be extremely careful to ensure the vocabulary used in debates on this issue is clarified and does not permit or allow for confusion or obfuscation. A sensation or perception of physical force resulting from high amplitude infrasound is difficult to describe to those who have not experienced it. While it has some similarities to high amplitude sound, such as aircraft take-off that may cause immediate physical pain in the ears, it is not felt as “pain” in the ears. While it has some similarities to rapid elevation change, it does not have the characteristic “ear popping” type sensation, but more general as a sense of being compressed with uncomfortable pressure within the head akin to high stress. While it has some similarity to motion sickness type nausea, again the sensation or perception is more general in effect over the entire person. A minor change in the frequency of high amplitude infrasound can be physically quite disturbing. The physical effects include a sense of pressure in the head or chest and throat, vertigo, nose bleeds, vomiting, anxiety induced heart palpitations and other symptoms normally associated with travel sickness like general nausea and include what can best be described as an “out of body” or “living in a fog” experience. These are compounded by a sense of anxiety developed from long term exposure and multiple forms of stress, such as continued muscle tension from instinctive efforts to resist intermittent or constant shaking. These symptoms are extremely distressing. Yet, over time, the acute episodic symptoms pale in comparison to relentless high amplitude noise on the edge of normal human hearing perception going on day after day. In any case, sleep disturbance has been ongoing and the effects of sleep deprivation alone have been debilitating. Following long exposure to these large amplitude vibrations it appears that I and my family have become more sensitive to detection of low frequency sound/vibration. I have noticed that I can perceive (“hear” and/or “feel”) a greater range of low frequency sounds than others who have not had the benefit of long term exposure. Those persons who have not had long term exposure to high amplitude infrasound commonly state they cannot hear or feel it. Those who spend time smelling and tasting wines become more sensitive to the nuance of aroma and taste of wines. Similarly, musicians notice sounds others do not and yachtsmen feel the wind shift ever so slightly. These are vastly more pleasurable diversions with which to become sensitive. We have struggled to find a suitable vocabulary that adequately describes to others, the effects upon our persons. In discussions with others who have been affected, we find common agreement on the actual effects, but have to use many words to clarify the nuance of sensation or perception. – The higher the pressure, the louder the sound. 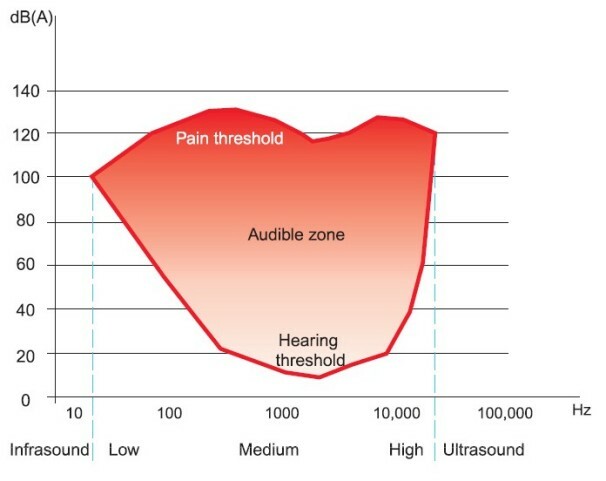 The above diagram shows the relative ability of the human ear to hear sound. Note that at the lower limit of human hearing (shown by the left hand dotted line) sound pressure at the threshold of hearing may be at 100dB, yet despite the very large amount of energy required to generate such a sound, use of the A weighted scale for normal human hearing simply removes this amount of energy from consideration. Ignoring low frequency vibration at high amplitudes on the basis of models of hearing ability of the average human ignores other physical effects that may arise from this transmitted energy. Legislative use of the A- weighted scale of sound pressure level discounts the actual sound pressure energy on the assumption that if a sound cannot be heard by the average human, then it simply does not exist. This faulty so-called science appears the basis for regulatory rejection of noise complaints. Like a mythical fairy waving their magic wand at the infrasound problem and saying, “vanish”! High amplitude Infrasound is NOT THE SAME as high amplitude audible sound, despite the related lexicon. Those affected by high amplitude infrasound may use similar words to describe an effect, but this does not convey meaning to a person who makes an assumption that the word used is limited only to audible hearing. The result is that infrasound is considered to not exist at all when measurements are made with equipment designed to capture sounds within the normal hearing range. Further, by careful selection of frequencies analysed, a tangible issue can be deliberately ignored. What is distasteful is that those who have had their sense of hearing developed through long term exposure to infrasound are scorned as crackpots. The following is a brief outline from my contemporaneous diary notes. I am happy to provide my complete diary notes to the Senate. In February 2013, infrasound levels at my house increased to such intolerable levels that my family still recalls the period as “when we got smashed”. My young son had been getting nosebleeds in concert with days of extreme “noise” and all family members were debilitated with nausea, vertigo and disturbed sleep. There was no rest. We even experienced what can best be described as hallucinations. It was just awful. The house would resonate, producing sounds louder than normal TV sound volume. Concentrating on dialog or the news became impossibly difficult. Dogs in the district would fight and howl in concert, the cat would howl to get out of the house. Windows and the upstairs floor would shake. On 13 January 2013, due to sleep disturbance, I drove to the Clarence Colliery around 1:30am and could feel the same “pressure” in and around the area. On 14 January 2013, I rang the Clarence Colliery (the closest colliery to my house) and they told me “not us, nothing has changed”. On 4 March 2013, from the Clarence Colliery rang to advise me a noise tester was coming to my house on the following day. On the 5th March at around 3:30pm, from SLR Consulting arrived and performed a 15 minute test. had told me he would be performing other night time tests around the area. His last test at our home was around 10:45pm. A short time later, noise and vibration increased markedly and I set off to locate and ask him to return to the house and perform a further noise test. I located him at Newnes. He told me he had to return to the mine to sign off and duly arrived at my house about 11:50pm, at which time the “noise” suddenly faded significantly. performed spot sound tests and detected a faint 17-18Hz signal in several parts of the house and left about 12.10 am. Noise and vibration returned the following day. A copy of the SLR Consulting Report is attached herewith as Appendix A. Relief didn’t last. By the 2nd May 2013, it was unbearable. I contacted the NSW EPA at Bathurst to raise a noise complaint. I commenced to build a wall between my house and the direction to the Clarence Colliery in an effort to make the house habitable. This is constructed of 30 one tonne concrete blocks 1200 x 600, placed 10 wide. Two weeks later, I added another row, raising the wall height to 3 metres and this appeared to reduce the noise/vibration impact, a little. 25th May 2013, the weekend was very bad, difficult to watch TV, hurting ears, pressure on head, sinus and nose bleeds, disturbed sleep. I drove to the Clarence Colliery and parked alongside, bringing the realisation that the noise/vibration was not coming from this source and that the wall may possibly be ineffective. 10th June 2013, noise was very bad, at around 1:00 am, I drove to Clarence Colliery and then to the Springvale Colliery ventilation facility, making the discovery that the “sound” and “pressure” in the vicinity of Springvale felt identical to what we were experiencing at home and unlike that at Clarence. 11th June 2014, I rang the engineer at Springvale, who told me “the drillers have just finished” and that he will “see what happens”. Thirty minutes later he called back asking me to not lodge a complaint and that he would arrange to send noise consultants to my house to perform a noise compliance test. I suggested it may be pointless to measure audible sound, but A-weighting audible noise meters arrived and were installed at my house. No noise report has been provided to me by Springvale. No improvement in habitability of my house resulted. It has remained oppressive and varying from barely tolerable to unbearable, with episodes of vertigo, nose bleeding and almost constant wearing of earplugs. Restful sleep or relaxing with music or television entertainment is impossibly difficult. Concentration on simple tasks has become difficult. The now constant sense of being uneasy is without doubt, directly related to relentless ongoing exposure to the high energy low frequency disturbance. During the October 2013 bushfires, we stayed in town and have to assume power was cut to the mines as it was just so quiet, we were able to obtain such peaceful rest and thought we may be happy to see more bushfires. Unfortunately, with the post-bushfire return of power to the mines, it appears that reduced scrub density now allows even more “noise” to affect us. 24th November 2103, the wall is now 3.6m high. Despite continuing assurance from so-called acoustic experts, it is beginning to appear likely it is pointless. 1st April 2014, the NSW EPA finally arrived to install equipment to perform noise testing. The date is appropriate. On 2nd May 2013, I had contacted the NSW EPA to raise a complaint for investigation into the nature and source of the nuisance high energy low frequency vibration at my house. The Noise Assessment Unit (NAU) of the NSW EPA conducted noise testing in April and May 2014. The EPA eventually furnished me with their report on 10 November 2014 after persistent requests and apparently, revision of their Report. Frankly, they missed the point. The EPA sought to only measure audible sound. The regulatory ramifications of finding no audible noise at a complaint level means there is officially no problem at my house with high energy vibration, infrasound or any other issue requiring regulatory intervention. “NAU detected the presence of an intermittent low frequency noise from its unattended monitoring campaign, however is unable to identify the source of the noise. This report is remarkable for it’s assumption that the Clarence Colliery was the source of the noise disturbance. There appears no effort to identify any source of infrasound. This report is also remarkable for the lack of analysis of frequencies identified in EPA sound recordings. The equipment used for recording sound is detailed in the report, as is the software used for analysis, but not the characteristics such as frequency sensitivity of microphones used, which appear appropriate for capturing sound in the normal range of human hearing. The data shows sound was recorded down to 10Hz, but with no qualification of the limitations or sensitivity at that frequency, or any other. Analysis of sound recorded by the EPA was restricted to a lowest frequency of 25Hz and a mathematical relationship between the A-and C- weighted scales for audible sound pressure level. EPA conclusions appear based on this simplistic analysis, ignoring clear evidence in the data collected. Figure 2 of the EPA report (on Page 10) shows a recurring strong noise band at about 16 Hz. This same frequency band is also observable in Figures 7, 9 and 10 of the same report. The NSW EPA report carefully excludes this frequency band, rendering the entire exercise of noise recording of little value and an utter failure at identifying the nature and source of the nuisance, as requested. Physical observations by my family do not relate to audible sound. Correlation is not anticipated, yet lack of correlation appears to be regarded as so-called evidence of faulty observation. Audible sound above 25 Hz is not the issue. On 26th May 2014, I hired noise test equipment which measured to a lower frequency than that installed by the NSW EPA. I have field calibrated and taken my own sound pressure level recordings. I have made over 700 separate 15minute recordings and I am happy to make these available to the Senate should they wish to seek data for independent analysis. In late May 2014, a new physical phenomenon arose in conjunction with particularly oppressive “noise”/vibration. My sense of smell began playing tricks with apparently foul smells that other members of my family denied. It was also painful to close my mouth. The first episode was for about 45 minutes around midnight on 12th May 2014. The following day, slightly distraught, I telephoned the EPA at Bathurst to ask about the reporting time frame and advise them the issue was continuing. It was suggested I don’t contact the mines. Around mid-June 2014, we learned some details of the newly installed Springvale mine ventilation fan through social connections. It’s a small town. It’s a large fan. Variations in the speed settings of this fan appear to correlate with sound recordings made by our hired equipment that show pulsing waves of 40 to 100+ dB under 10Hz in 15 minute blocks of time. We have been led to understand that running the mine ventilation fan at reduced power is a considerable cost saving in electricity costs. This may not be a design condition. This raises the issue of whether Planning Permission is based on single-state design conditions for the ventilation fan or variable operations management conditions. The Senate may be able to obtain from the fan manufacturer, the acoustic performance, design and operational parameters. 30th June 2014. I attended a meeting of the Lithgow Council and raised the issue of infrasound disturbance, to have it listed as an Agenda Item for the next meeting. I promptly became subject to disparagement. Apparently I’m a hippy trying to close the mines! However, within days, the “noise” subsided and the weekend of 12 July 2014 was a notable welcome respite. 28th July 2014. Several individuals, including myself, addressed the Local Council Meeting in respect of low-frequency “noise” disturbance. Lithgow Council has responded with a letter, attached as Appendix C.
It now appears that both Springvale and Angus Place mines have newly installed large ventilation fans capable of producing high energy low frequency “noise. The Springvale ventilation fan modification was approved by Lithgow Council, not through State Planning DA 461/02 of 30th May, 2012 as suggested by their letter. Curiously, State Planning’s website listed “Angus Place dewatering facility” up until closing of submissions, then changed the website listing to “Angus Place ventilation facility”. There’s that funny smell again. Following the Lithgow Council meetings, I was contacted by… , Community Environmental Liaison Officer (CELO) for Centennial Coal. Infrasound levels initially went down and stayed down for about one week, then went up and down from day to day. The CELO told me they had an acoustic specialist from SLR Consulting taking measurements and that “we have a low frequency problem”. From time to time I was asked “whether the noise had got better”. Through August, September and into early October infrasound levels varied between the unbearable and a lower level, yet still quite intrusive. I raised the wall to 4.8 metres and added 30 tonnes of soil in an effort to “break up” incident energy waves before they reached the house. We had to abandon the house on several occasions, experiencing chest pains, nausea, anxiety, aching kidneys, disturbed sleep and no restful enjoyment. My wife had episodes of her hands and arms going numb. I understand from conversations that this corresponded with the collieries varying fan speeds and movable air baffles within the mine. The ventilation shafts are analogous to organ pipes and as different ventilation arrangements are made, resonance change occurs, in addition to varying fan blade tip energy dissipation. However, noise disturbance of all types began to gradually reduce. 9th October 2014, the CELO from Centennial Coal contacted us to advise that a Mr Steven Cooper was arriving to perform sound tests. We were not informed as to the purpose of these tests and assumed that Centennial had simply changed acoustic consultants. At this time we had yet to receive the EPA report. 12th – 29th October 2014. Mr Cooper’s recording equipment installed at house site, then removed. My family was provided forms to fill out for each day. These “sensation logs” were supplied by Centennial Coal, apparently a modified version of a standardised format initially supplied to Centennial by Mr Cooper. We are now concerned that having been directed to use modified sensation logs means the information and data recorded is not comparable with other scientifically rigorous, standardised research data collection such that apples cannot be compared with apples. We found the modified sensation logs confusing. During the period in which Mr Cooper’s equipment was installed, infrasound disturbance was relatively low and remained so. We understand that there was almost no variation in operational conditions of the mine during this period. I am bemused that a colliery chose to use one acoustic consulting company to minimise “noise” levels in advance of bringing in another consultant to measure these minimums for regulatory purposes. Perhaps my experience with phantom smells is relevant. Audible sound is not. I understand from conversations that infrasound levels vary significantly when the colliery exhaust fan is run on reduced power to save costs on electricity usage and that minor variations occur depending on positioning of air regulators. This latter point is relevant to wind power generators rotating at different speeds under different wind loadings and generation output. Infrasound output appears related to loading and rotational speed of the fan blades, but the lack of appropriate measurements capable of determining the exact nature of the “noise” means that governments and the public have been blinded as to whether a problem exists at all. While I initially speculated that the ventilation fan at Clarence Colliery was the source of noise nuisance, this has not been confirmed or denied by any credible science. According to the NSW EPA there is no noise nuisance and hence no source. Pretending that an infrasound problem does not exist by so-called science of doubtful propriety does not provide confidence in government regulation of community disturbance. I urge the Senate to seek truly independent research and to not rely upon so-called “science” produced or “interpreted” by the commercial parties to reach conclusions. Infrasound effects on humans are real and intolerable. It is abundantly clear that regulatory approval for installation and management of such high energy equipment has failed to adequately understand the consequences. It appears slap dash and mediocre. Current in-service regulation of “wild” energy emissions such as infrasound is utterly inadequate. It is possible that manifestations of other sub-clinical health effects are apparent in the Lithgow community. A public health analysis of the region may shed light upon this. At this stage, to obtain relief, I am being forced to abandon Lithgow and with that, my livelihood and social connections of my family.